Many researches have discussed the dynamics of the vehicle seat structure in response to vibration. The structural dynamics of the seat is linked to the seat noise, vibration and harshness (NVH) quality. 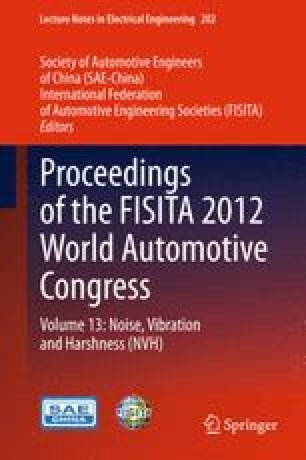 The interaction of the vehicle seat resonances with the seat mounting points or the floor resonances may considerably increase the transmission of the vibration into the seat and cause either vibration discomfort or the rattle noise. The vehicle seat rattles or, in general, buzz, squeak, and rattle (BSR) noises are one of the major issues which are directly linked to the NVH of the vehicle. Predicting and improving the seat BSR noise in early design phase is still challenging. This is mainly due to the complexity, nonlinearity and uncertainty of the impact mechanism at joints contributed to the rattle. In this research, two experiments are designed. The first experiment is set up to characterize the seat resonant frequencies and its corresponding structural mode-shapes. The second experiment is designed to measure the seat radiated noise when it goes under vibration excitation. Alternatively, a concept Computer Aided Engineering (CAE) model of the seat is developed and the seat structural dynamics is characterized by using this analytical model. Comparisons of the results of the simulation and experiment validate the developed CAE model. The seat structure demonstrated two major torsion and fore-aft bending structural modes in low vibration frequencies (<50 Hz) where the structure have more potential to be rattled. We have confirmed that the occurrence of the rattle noise is related to the seat structural dynamics and it can be controlled and managed by modifying the structure. Two modifications are designed using the seat CAE model. One modification is designed to increase the seat torsion resonance nearly 4 Hz, and the second modification is conducted to decrease the seat torsion resonance nearly 4 Hz. The designed modifications are then implemented on the test seat and the rattle noise is measured on the two modified seats. The results confirm that by changing the seat resonant frequency, the rattle noise and in general BSR noise can be improved or controlled accordingly. Consequently, characterization of the seat structural dynamics leaded to control and improve the seat BSR noise in early design phase by using the seat CAE model.